To win you need to enter . 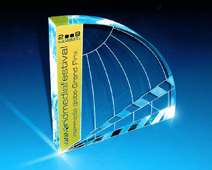 . .
All winners of the intermedia-globe Silver and Gold are notified prior to the festival event to make sure they are present at the Gala for the Award Presentation Ceremony personally. The winners of the GRAND AWARDS and the GRAND PRIX, along with the winners of the SPECIAL AWARDS, will be announced at the Gala for the Award Presentation Ceremony in Hamburg in the evening of May 13, 2009 - not before. for a programme highlighting actions by a state, government, corporation, organisation or individual resulting in improvements in the lives of individuals or in society as a whole. for a programme revealing abuse of our small planet and its creatures through damage to the environment or through actions that impact in a negative way on the social, political or economic health of society. or a composer, who with outstanding skill, sensitivity and creativity brought together pictures and music to make one seamless entity. for a sponsored programme best suited to inspire and to motivate an international audience.